Mediastinitis may be acute or chronic. There are four sources of mediastinal infection: direct contamination, hematogenous or lymphatic spread, extension of infection from the neck or retroperitoneum, and extension from the lung or pleura. The most common direct contamination is esophageal perforation. Acute mediastinitis may follow esophageal, cardiac, and other mediastinal operations. Rarely, the mediastinum is directly infected by suppurative conditions involving the ribs or vertebrae. Most direct mediastinal infections are caused by pyogenic organisms. Most mediastinal infections that invade via the hematogenous and lymphatic routes are granulomatous. Contiguous involvement of the mediastinum along fascial planes from cervical infection is frequent; this occurs less commonly from the retroperitoneum because of the influence of the diaphragm. 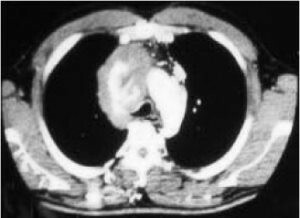 Empyema often loculates to form a paramediastinal abscess, but extension to form a true mediastinal abscess is uncommon. Extension of mediastinal infections to involve the pleura is common. Esophageal perforation, the source of 90% of acute mediastinal infections, can be caused by vomiting (Boerhaave’s syndrome), iatrogenic trauma (endoscopy, dilation, operation), external trauma (penetrating or blunt), cuffed endotracheal tubes, ingestion of corrosives, carcinoma, or other esophageal disease. Mediastinal infection secondary to cervical disease may follow oral surgery; cellulitis; external trauma involving the pharynx, esophagus, or trachea; and cervical operative procedures such as tracheostomy, mediastinoscopy, and thyroidectomy. Emetogenic esophageal perforation (Boerhaave’s syndrome) is usually associated with a vomiting but in some cases is insidious in onset. Severe boring pain located in the substernal, left or right chest, or epigastric regions is the chief complaint in over 90% of cases. One-third of patients have radiation to the back, and in some cases pain in the back may predominate. Low thoracic mediastinitis can sometimes be confused with acute abdominal diseases or pericarditis. Acute mediastinitis is often associated with chills, fever, or shock. If pleural extension develops, breathing may aggravate the pain or cause radiation to the shoulder. Swallowing increases the pain, and dysphagia may be present. The patient is febrile, and tachycardia is noted. About 60% of patients with acute mediastinitis have subcutaneous emphysema or pneumomediastinum. A pericardial crunching sound with systole (Hamman’s sign) is often a late sign. Fifty percent of patients with esophageal perforation have pleural effusion or hydropneumothorax. Pneumomediastinum or pneumothorax following esophageal endoscopy are sine qua non of esophageal perforation. Neck tenderness and crepitation are more often found in cervical perforations. The diagnosis may be confirmed by contrast x-ray examination of the esophagus, preferably using water-soluble media. Endoscopic visualization of the perforation is not recommended as an initial diagnostic maneuver as this may inadvertently extend the perforation. Chest CT scan with oral and intravenous contrast is helpful in determining the level of the perforation, the degree of mediastinal soilage as well as possible underlying esophageal or pulmonary pathology. The patient, however, must be clinically stable to be subjected to the rigors of these tests. For more critically ill patients, simple oral administration (or administration through a proximally placed nasogastric tube) of contrast and a simultaneous portable chest x-ray in an ICU setting can often confirm the diagnosis. Myocardial infarction is sometimes mistakenly diagnosed in patients with esophageal perforation when a predisposing cause of pneumomediastinum is not apparent. Surgical management of intrathoracic esophageal perforation and acute mediastinitis depends on the underlying cause (iatrogenic, tumor, stricture, etc) and the amount of elapsed time from leak to diagnosis. All intrathoracic leaks should be surgically explored. Initial management includes immediate drainage of associated pleural contamination by large-bore chest tubes and decompression of the occasional pneumothorax. Broad-spectrum antibiotics, including antifungal therapy, are initiated and vigorous fluid hydration administered. Typically, a right thoracotomy offers the most access to the intrathoracic esophagus and should be used through the sixth interspace. Even distal left-sided perforations can be managed from the right side. A left thoracotomy, however, is useful when a perforated esophagus from a distal esophageal stricture is encountered. Treatment of an immediately recognized (< 24 hours) iatrogenic esophageal perforation in an otherwise normal esophagus includes primary two-layer closure with careful attention to complete mucosal closure by interrupted absorbable sutures. Esophageal muscle is then closed over the mucosal injury and buttressed with either a flap of parietal pleura, diaphragm, or intercostal muscle. Copious irrigation and wide drainage is performed. Occasionally, closure over a T-tube drain has been successful. Esophageal perforations more than 48 hours old are widely drained and the esophagus either defunctionalized or resected. This depends on the degree of mediastinal soilage discovered upon exploration, the extent of sepsis, and the patient's performance status. When perforation occurs secondary to esophageal cancer or manipulation for severe reflux stricture, achalasia, or an otherwise abnormal esophagus, different surgical options exist. If the perforation is recognized immediately and the patient is not floridly septic, esophageal resection is preferred. Reconstruction (usually with a gastric pull-up) can be done at the same setting but only if the patient is stable and the degree of contamination minimal. Otherwise, reconstruction is performed at a later date when the patient has fully recovered from the septic event. The mortality associated with acute mediastinitis and esophageal perforation remains high (30–60%) despite advances in critical care, nutritional support, and operative management. The specific surgical approach — repair versus diversion or resection — must be tailored to the individual circumstances (mechanism of perforation, underlying pathology, time to diagnosis, and patient performance status) in order to achieve optimal results.